My last relay had ended in collapse and the feeling that I was going to projectile vomit in the hedge. As this was a BEER relay, I had my suspicions that despite it being only 2 miles, this one might end in a similar fashion. I’d been talked into this by Lozza, her sister Helen and Liz. I’d tried to wriggle my way out by complaining that relays weren’t my favourite things at the moment but they’d shouted me down; “There’s BEER and RUNNING. You like both of those things.” I couldn’t argue. I decided to pretend that instead of it being a relay running race, it was just a VERY FAST walk to the pub. When I arrived, there were a lot more people than I’d expected, a mix of pub teams, club runners and what appeared to be part of a circus sideshow. There was what looked like a Village People reunion, Scooby Doo, some rather enthusiastic running cheerleaders (let's see you spell V-O-M-I-T after 2 miles fast running and 6 pints), the obligatory women-dressed-as-fairies and the bearded ladies. The 'Bearded Ladies' were confusing. I wasn’t entirely sure whether some particularly hirsute ladies were jumping on board the goatee-train or some shapely chaps were deciding to embrace their feminine sides with sequinned dresses. They weren't in my race category so I wasn't going to complain. Although I was tempted to go and ask for style tips. They were rocking the sparkles and trainers look. Team Helen Wyatt (Helen decided to go with the modest method of choosing a team name) soon found each other and we took a few minutes comparing legwear. Without prior arrangement, we’d each turned up in a pair of our most eye-wateringly bright running socks. We may not win any relay prizes but should there be any award for the most retina-searing socks, we had it in the bag. After a few minutes of bickering about placings, I got the last leg of the relay. I was relieved. No handover at the end, which meant less opportunity for me to drop the baton, mess up the changeover or accidentally trip up my team mate. 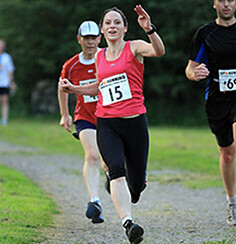 Helen was on the first leg and she left at top speed, making fast running look easy. Her diamond patterned neon pink socks flashing as she ran. We ran to the top of the park at about mile 1.5 of the 2 mile loop, in time to see her pass. Slow down Helen – you'll show the rest of us up! She even managed to smile and wave at the camera without falling over or gurning. Dammit Helen – you're making the rest of us look bad! Lozza was already in the starting area, getting ready to receive the baton so Liz and I sprinted back down the park to cheer Lozza off. With all this running around cheering team mates, at least we were getting a good warm up before our races. Lozza had had told us all she would be taking it very easy as she had her ‘A’ race in 2 days time. But as soon as she got the baton, she was off. Sprinting. Both feet off the floor, flying along! Sod PBs. 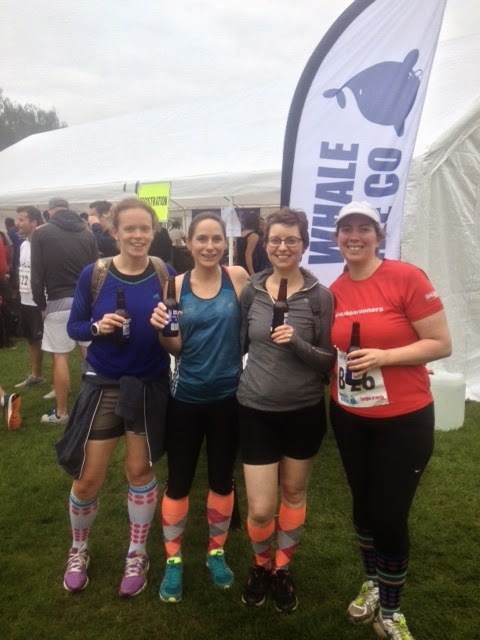 If you want us Midlands girls to run, just put beer at the finishing line. 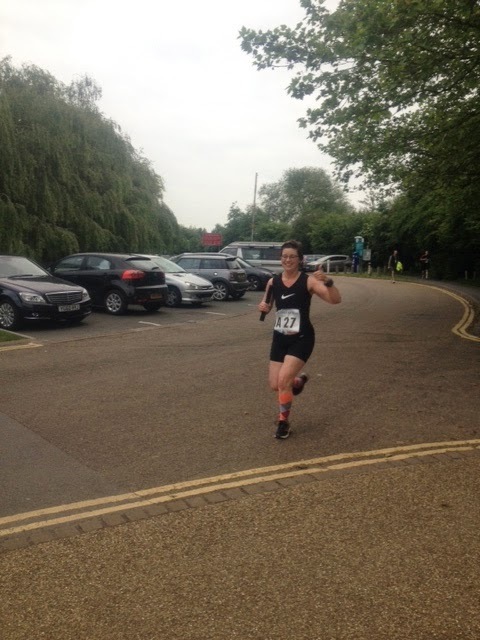 Lozza sprinted around the park until she was out of sight, looking as though she was finding it all very easy and not at all as though she had a 70.3 Half iron Distance triathlon in 2 days. She flew round and was back to the changeover point in no time. Lozza handed over to Liz who also took off at top speed. Her spotty socks bright in the fading light as she turned the corner onto the twisty lanes of the park. I got myself into the starting pen and started muttering the Relay Prayer to myself. Relay Prayer: Don’t drop the baton, don’t trip up a teammate, don’t fart at crossover. I heard a shout from Ali – supporter and photographer extraordinaire – Liz was coming around the last corner! Eeeeeek!! 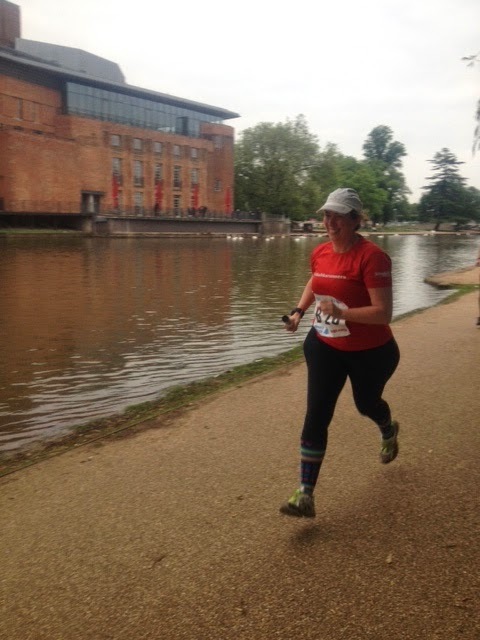 My heart rate rising and nerves reaching extreme levels, I watched the far corner next to the canal where Liz would be appearing and tried not to wet myself in fear of taking part in a another relay after the last disaster. At least there it was unlikely there would be ants in this relay. I had been unsure how to pace a 2 mile run. I decided that to try 1 mile pace and hold on as long as possible would probably be the best way to blow up nastily at 1.5 miles, lose control of bodily functions and both defecate and vomit simultaneously in front of a crowd of spectators. Not good. I decided to treat it as a fun run rather than worrying about pace and times. This was a fun relay – a BEER relay. There was free beer at the end. This relay was ALREADY a win. So I decided to sod pacing. I'd run it gently, just try to collect overtakes and my main goal would be to not lose the baton on the way round the course. All I had to do was trot round and collect a beer at the finishing line. SPOTTY SOCKS!!! I recognise those socks! It's Liz! Muttering the Relay Prayer, I grabbed the baton from Liz and caught up in the excitement, set off at a mad sprint which I maintained until I looked at my watch. Ooh. Can’t maintain this pace. Legs won’t slow down. Never mind It feels ok at the moment. Just overtake that person in front of you. Collect the overtakes. Slow down Man or I can't overtake you! Gotcha. Cyclist in front of me. Why is there a CYCLIST? Can I catch that man in black who looks like a running ninja? No. Argh! Path is narrowing and the cyclist is trying to overtake me … it's all going to end in tears and broken gears. Phew – she let me go first. I must already have my 'Mental Runner' face on. Dammit. That doesn't usually happen until at least mile 2. Onto the pavement, round the pub, a brief smell of beer and peanuts. Back into the park and along a long straight path shaded by trees, more people in front. Overtake, overtake, am like a lycra dalek! One goal … not to be dead last. Overtaken by an older man who sped up and disappeared into distance. Push! Just get past this tall man who swerves as though to avoid being overtaken (disliking being overtaken by a girl? ), down a steep slope and a sharp right turn. I’d been looking forward to the downhill but it was too sharp and the turn too steep to take advantage. Legs also working at almost their max not happy at the change of pace. Man who overtook me is running in the distance in a blue shirt. Into the car park! Ooh my car! Past my car and up to the corner. Overtake that girl! It's my friends! My friends! Shouting and cheering me! A HUGE boost and I’m back into the park proper and just 3 sides of a square before the finish line. Legs waking up now – the finish arch so close! Can I catch the man in blue? Don’t get overtaken!! Push! Legs flying. Can’t quite catch him. Under the arch, legs slowing, Helen to welcome me in. My head is spinning and I have the ‘don’t want to sit down’ but ‘don’t want to keep going’ feeling. Legs won't stop. Well if the legs are going to keep going, then they may as well keep going towards the beer tent. We received our free beer which was claimed by having a cross put through the running numbers pinned to the front of our vests. Bottles were handed over the bar and we stood in the warm dusk outside the beer tent. Happily we drank together, pleased with our little selves and our tired legs. Beer doesn't taste any better than this. We stood there, chatting, talking over our relay legs. Beers in our hands, friends around us and a good race run. Then suddenly … our names over the tannoy. What? Winning ladies team? There must have been a mistake. We're doing this for fun! And for the beer! We were assured there was no mistake and a little plaque was handed to each of us. The perfect end to a great evening. And the relay prayer? Well 2 out of 3 wasn’t bad. Fantastic race report as usual :-). Congratulations, winners! Thanks Autumn! I just needed a beer at the finishing line to give me the motivation to push a bit harder!! :) Maybe I should put a beer at the finishing line of EVERY race! 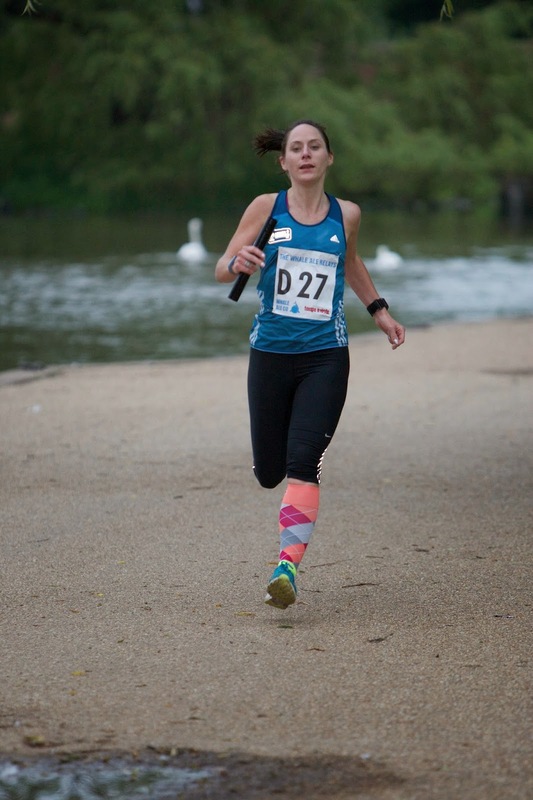 Brilliant race Sarah, loved reading it and great pics :) 1st ladies one and all !